Follow Your Dreams to California. Follow Your Heart to UCR. We know you are capable of great things, and we want to be a part of your academic and professional success. Our award-winning faculty will mentor you. Our diverse campus community will embrace you. And our international-student resources will help you build your future! Sunny Southern California invites you to make the University of California, Riverside (UCR), your home away from home. You are considered an international applicant if you are not a U.S. citizen or permanent resident. U.S. citizens or permanent residents, who have completed coursework outside the United States, should follow the international admissions requirements for the country in which the coursework was completed. UCR's admissions selection process is the same for both international and U.S.-educated applicants. If you have questions about your specific situation, please contact an international admissions counselor and we will help! The cost of attending UCR is extremely competitive with private institutions and other University of California campuses. Expenses associated with living in Riverside are considerably less than those of nearby metropolitan areas, such as Los Angeles, Orange County and San Diego. Read on to learn more about the programs available to help you pay for your UCR degree and how much that degree costs. *Tuition and fees are estimates and are subject to Regental approval. Fees are of August 2018 and are subject to change. Along with the $165 One-Time Document Fee charged to all new students, incoming international freshmen will be charged the mandatory $270 Highlander Orientation Fee, and international transfers will be charged $90. Student Health Insurance Plan: You’re automatically covered! Fill out the helpful form at go.ucr.edu/estimate to get an estimate of what your full-time cost of attendance at UCR could be. Improve essential academic and languages skills with UCR’s Admission Preparation Program (APP). Participating in this educational program does not in itself provide preference in admission to the University of California. If you're interested in applying to UCR, view the freshman student admission requirements or the transfer student admission requirements. You can also contact the UCR Undergraduate Admissions office for details about the admission process. As one of the most prestigious universities in the United States, UCR sets high admission standards. Incoming students are selected based on a wide range of criteria: academic performance, standardized exam scores and the potential for success as an undergraduate. Each year we celebrate the valuable perspective of over 1,500 international students at UCR. They represent more than 75 countries and enhance our campus and worldwide community. Along with the minimum admissions requirements that California residents must meet, international applicants must also follow these instructions that apply specifically to them. Prepare for admission to UCR with the International Freshman Admission Checklist. Pass the Test of English as a Foreign Language (TOEFL) with a score of 80 or higher (iBT). Pass the Test of English as a Foreign Language (TOEFL) with a score of 60 or higher on the Paper Based Test (PBT). Pass the International English Language Testing System (IELTS) with a score of 6.5 or higher. Score 560 or higher on the Writing section of the SAT or 31 or higher on the new SAT Writing and Language test. Score 24 or higher on the combined ACT English/Writing or English Language Arts (ELA). Achieve a score of 3, 4 or 5 on the AP Exam in English Language and Composition or English Literature and Composition. Achieve a score of 6 or 7 on the International Baccalaureate (IB) Higher Level Examination in English (Language A). Complete a transferable college course in English Composition with a C grade or better. English proficiency must be proven for both freshman and transfer applicants. Please report all test scores as soon as possible. Improve essential academic and languages skills with UCR’s Admission Preparation Program (APP) ! UCR grants credit for all Advanced Placement exams on which a student scores three or higher. Units awarded toward UC graduation may be granted for specific subjects and/or for general education/ breadth requirements, as determined by each campus. AP exams can also be used to meet the minimum transfer admission subject requirements in English, math and four other courses chosen from the humanities, behavioral/social sciences and biological/physical sciences. The IB organization awards either a diploma or a certificate for individual IB exams. Students who complete the IB diploma with a score of 30 or above will receive 30 quarter (20 semester) units toward their UC degree. Students who receive IB certificates with a score of five or higher on Higher Level exams will receive eight quarter (5.3 semester) units. UCR grants credit for the General Certificate of Education (GCE) Advanced Levels (A-Levels), the Cambridge International A-Levels, the Singapore-Cambridge GCE A-Levels (H2) and the previously administered Hong Kong Advanced Level Examination (HKALE), in content-based subjects similar to courses offered at UC and in which grades of A*, A, B or C are awarded. UCR grants 12 quarter (eight semester) units of credit for academic courses only for GCE, Singapore-Cambridge and Hong Kong A-Level exams. For country-specific admission requirements, visit international admissions requirements by country or educational system, or email an international admissions counselor at internationalinfo@ucr.edu. To meet minimum requirements to be considered for UCR selection, you must earn a minimum GPA of 3.4 on a 4.0 scale (equivalent to an 85 percent on a 100 percent scale). The assessment of a qualifying GPA is based on “a–g” courses (required high school/secondary classes) completed in years 10 and 11. If the high school/secondary school offers a different curriculum, your academic achievement will be based on that educational system’s grading scale. The ACT with Writing or the SAT with Essay must be taken no later than December of the final year of secondary school. The SAT subject tests are not required. They do, however, demonstrate subject mastery and may meet an “a-g” requirement or fulfill recommendations by the Marlan and Rosemary Bourns College of Engineering (BCOE) and the College of Natural and Agricultural Sciences (CNAS). Both colleges recommend Math Level 2 and either Chemistry or Physics. International students need a valid passport, nonimmigrant visa (F-1 or J-1) and the appropriate documentation to study at an accredited university in the United States. Learn more about visa and U.S. entry requirements. Before you begin, find out what important information is needed for an accurate fall admission application. You can also find information about specific international admission requirements. Then learn about tips and tools that are specific to international freshman applicants. Learn more about what you’ll need. Order Test of English as a Foreign Language (TOEFL) and International English Language Testing System (IELTS) to be sent. 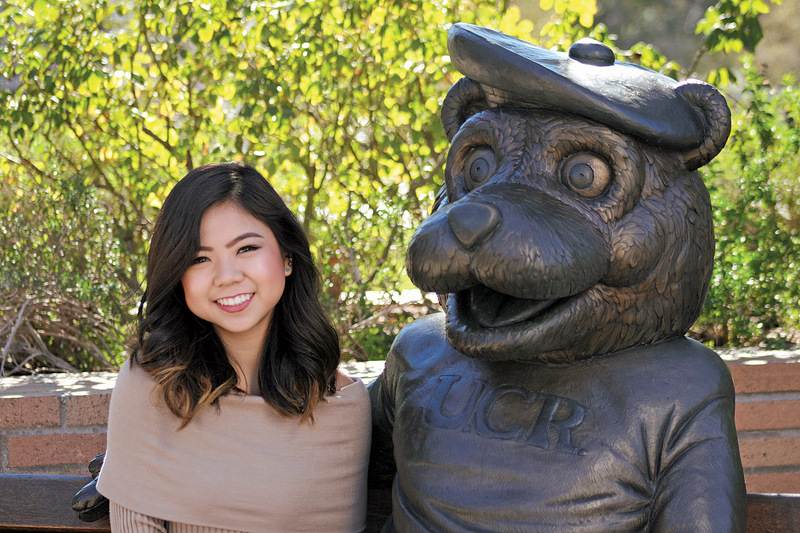 The UC application for fall admission to UCR opens on Aug. 1. The fee is $80 for each UC. You can apply for a fee waiver — provided you have your family’s income and the number of people supported by it — when you fill out the application. The fall application filing period is Nov. 1-30. If you have difficulties, contact ucinfo@applyucsupport.net or call (800) 207-1710 (in the U.S.) or +1 (310) 513-2715 (outside of the U.S.). UCR Undergraduate Admissions will email instructions on how to access your MyUCR admission portal account. Log in regularly to check your admission status, respond to messages, and track important dates and deadlines. 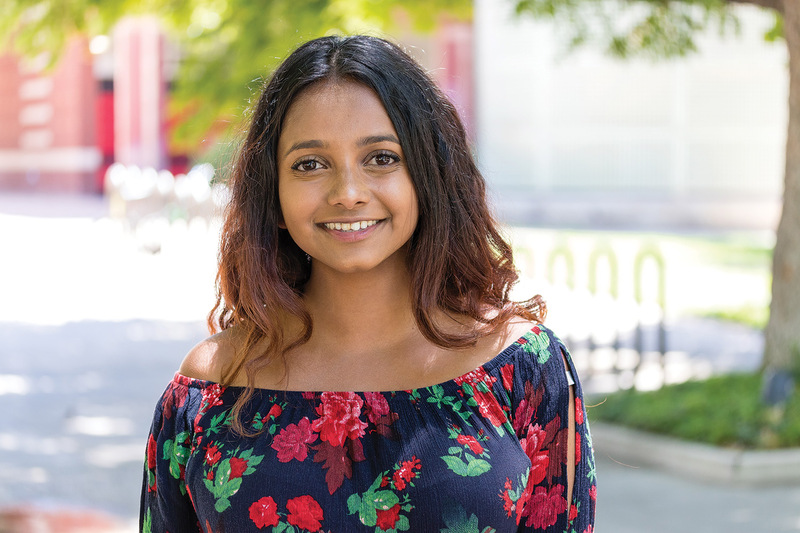 "The professors and staff go out of their way to help you whenever you encounter obstacles, making sure that you make the best of your college experience. UCR students collaborate and help one another, be it academically or non-academically. They invite you to family gatherings and outings with high school friends, making you feel welcome." Along with the minimum admissions requirements that California Community College transfers must meet, transfers from international colleges must also follow these instructions that apply specifically to them. Prepare for admission to UCR with the International Transfer Admission Checklist. UCR's admissions selection process is the same for both international and U.S.-educated applicants. Transfer applicants are registered at a college/university for a regular session after high school. Transfer applicants cannot disregard their college record and apply as a first-year student. U.S. citizens or Permanent Residents, who have completed coursework outside the United States, should follow the international admissions requirements for the country in which the coursework was completed. If you are transferring from a four-year, out-of-state two-year, or UC school, please see special instructions that apply to you. If you are transferring from a California Community College, your admission requirements are outlined below. You must complete 60 semester (90 quarter) units of transferrable college credit. Admission to UCR to selective, so strive to surpass the minimum. Some major programs require a minimum GPA that is higher than that of basic admission. No more than 14 semester (21 quarter) units may be Pass/Not Pass. Four transferred courses chosen from at least two of these subject areas: arts and humanities, social and behavioral sciences, or physical and biological sciences Each course must be transferable and worth at least 3 semester (4–5 quarter) units. Use ASSIST.org to see if your classes will transfer before taking them. Students transferring from California Community Colleges can use the UC Transfer Admission Planner (UC TAP) to track your coursework and monitor your progress. You can enter your coursework (completed and planned) from the beginning of your college career (or whenever you decide to transfer to UCR). You should still meet with counselors, as this tool does not replace in-person advising. The UC TAP also serves as your Transfer Admission Guarantee (TAG) application. Achieve a score of 31 or higher on the new SAT Writing and Language Test. Achieve a score of 5, 6 or 7 on the International Baccalaureate (IB) Higher Level Examination in English (Language A). We grant credit for all Advanced Placement exams on which a student scores 3 or higher. Units awarded toward UC graduation may be granted for specific subjects and/or for general education/ breadth requirements, as determined by each campus. AP exams can also be used to meet the minimum transfer admission subject requirements in English, math and four other courses chosen from the humanities, behavioral/social sciences and biological/physical sciences. The IB organization awards either a diploma or a certificate for individual IB exams. Students who complete the IB diploma with a score of 30 or above will receive 30 quarter (20 semester) units toward their UC degree. Students who receive IB certificates with a score of 5 or higher on Higher Level exams will receive 8 quarter (5.3 semester) units. We award credit for the General Certificate of Education (GCE) Advanced Levels (A-Levels), the Cambridge International A-Levels, the Singapore-Cambridge GCE A-Levels (H2) and the previously administered Hong Kong Advanced Level Examination (HKALE), in content-based subjects similar to courses offered at UC and in which grades of A*, A, B or C are awarded. We grant 12 quarter (8 semester) units of credit for academic courses only for GCE, Singapore-Cambridge and Hong Kong A-Level exams. Take the recommended lower-division/general education/breadth classes for your major. Students who transfer from California Community Colleges can take the recommended lower-division/general education/breadth classes for your major. Some programs recommend the Intersegmental General Education Transfer Curriculum (IGETC), which is a series of courses that California Community College students can complete to satisfy first- and second-year general education requirements before transferring. Some programs want you to focus on prerequisites instead of IGETC. Use ASSIST.org to see what your major program recommends or contact a UCR admissions counselor for help. Connect with the Transfers First Program for support, advocacy, planning and more. You are strongly encouraged to focus on completing transferable math and science classes. IGETC is not accepted as a way to complete the required breadth classes for College of Natural and Agricultural Sciences (CNAS). However, courses taken to satisfy IGETC may also go toward completing those requirements. Use ASSIST.org to view the prerequisites you must take for your intended major (and to make sure your classes will transfer). Learn more about being a CNAS student and becoming a new transfer student to CNAS. Learn more about being a GSOE student. Complete community college courses equivalent to seven lower division UCR business major requirements as listed on ASSIST.org. Attain a minimum GPA of 2.8 in all UC-transferable coursework. These GPAs are a baseline for consideration and are not a guarantee of admission. Click here for more information on major requirements. Before you begin, find out what important information is needed for an accurate winter admission application. The UC application for fall admission to UCR opens on Aug. 1, and the fall application filing period is Nov. 1-30. The UC application for winter admission opens on July 1, and the winter application filing period is July 1-31. The fee is $80 for each UC. You can apply for a fee waiver — provided you have your family’s income and the number of people supported by it — when you fill out the application. If you have difficulties, contact ucinfo@applyucsupport.net or call (800) 207-1710 (in the U.S.) or +1 (310) 513-2715 (outside of the U.S.). Access the fall quarter UC application. List all courses and grades as they appear on your transcripts, and apply for scholarships in your country of secondary education or in the United States. Submit your fall quarter UC application. December Take all required exams (ACT with Writing or SAT with Essay Test; and the TOEFL or IELTS exam) before Dec. 31. Fall admission notifications begin. Visit my.ucr.edu to view your admission status. Freshman Students – Residence Hall contracts become available on March 1. The Guaranteed Housing Deadline for freshmen is May 10. Transfer Students – Submit a Campus Apartment application as soon as possible. Deadline for freshmen to submit your Statement of Intent to Register (SIR). Housing Note: If you plan to live in campus housing, submit your housing contract or application, and first housing payment as soon as possible. The Guaranteed Housing Deadline for freshmen to submit a Residence Hall Contract is May 10. Although there is no deadline for transfer students to submit an application for Campus Apartment housing, Campus Apartment housing is highly impacted. Housing Note: Residence Hall housing for freshmen and Campus Apartment housing for transfer students may still be available on a first-come, first-served basis. If you plan to live in campus housing, submit your SIR, housing contract or application, and first housing payment as soon as possible. Deadline to register for Highlander Orientation. Final official transcripts, test scores and supporting documents due to Undergraduate Admissions. Test scores and supporting documents due to Undergraduate Admissions. Access the winter quarter UC application. Apply for scholarships in your country of secondary education or in the United States. Submit your winter quarter UC application. Winter admission notifications begin. Visit my.ucr.edu to view your admission status. Guaranteed Housing Deadline for freshmen to submit a Residence Hall contract. Although there is no deadline for transfer students to submit an application for Campus Apartment housing, Campus Apartment housing is highly impacted. UCR is dedicated to your success, and offers a range of programs and resources to support you along your path to a UCR degree. Get guidance from faculty and student mentors. Excel in your courses with the help of a tutor or study group. Connect with a wellness department to take care of your physical, mental and emotional health. Develop as a leader in a campus organization. Make a smooth academic transition to UCR with the guidance of faculty and student mentors through first-year and transfer programs offered by our colleges and schools. Freshman and transfer students can also register for Student Life's First Year Mentor Program and connect with experienced/trained student leaders who answer questions and provide support throughout your first year at UCR. As a parent/guardian of a UCR student, you have access to many resources that will help you to support your student during this journey. Learn how to get involved and stay connected, and find out how we will keep your student safe, happy and healthy. Play an integral role in your student's UCR experience with the Parents Association. Request a virtual presentation or Skype appointment. Speak with an international admissions counselor for a 45-minute, one-on-one virtual presentation. Learn about UCR during a 30-minute Skype appointment. Speak with either an international admissions counselor or a current UCR student.